URB-E in Austin Recap | URB-E Everywhere! Last week, URB-E visited Austin for the world renowned innovation and music festival South by Southwest. During the festival, the streets of downtown Austin are flooded with people going from one venue to another, and this year the URB-E took over the city as the easiest way for visitors, sales teams, and artists alike to get around town. Amazon Launchpad, LUXE Valet, WeWork, and the W and Driskill hotels all used URB-E to get around, and festival goers couldn’t buy URB-Es fast enough. The reaction to URB-E was overwhelming; we felt like celebrities! Everywhere URB-E rode, people on the street cried out “URB-E!” behind us. 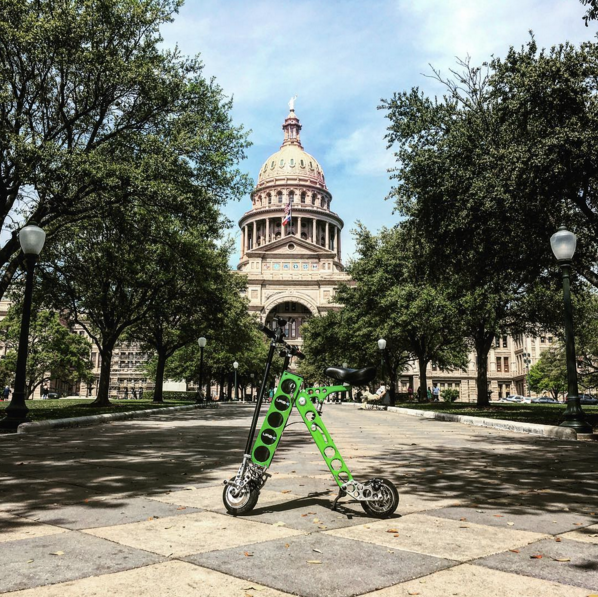 Visitors stopped us for test rides at every corner and almost always ended their ride asking, “Where can I get one?” Here’s a recap of our SXSW activities, from parties to test rides to business partnerships. URB-E was all over the map, strutting its awesome stuff as the ultimate festival vehicle. Our first task was dropping off a fleet of URB-Es for the SXSW Sales Team to use during the festival. SXSW events happen all across downtown Austin–some of them more than four miles away from others–and car traffic is always clogged. The SXSW Sales Team couldn't wait to use their URB-Es to cut across town in a matter of minutes! We started off SXSW with the startup crawl hosted by Atlassian. Hundreds of startups from all over the world crowded the floor to swap ideas and snag some brisket tacos and local Austin beer. 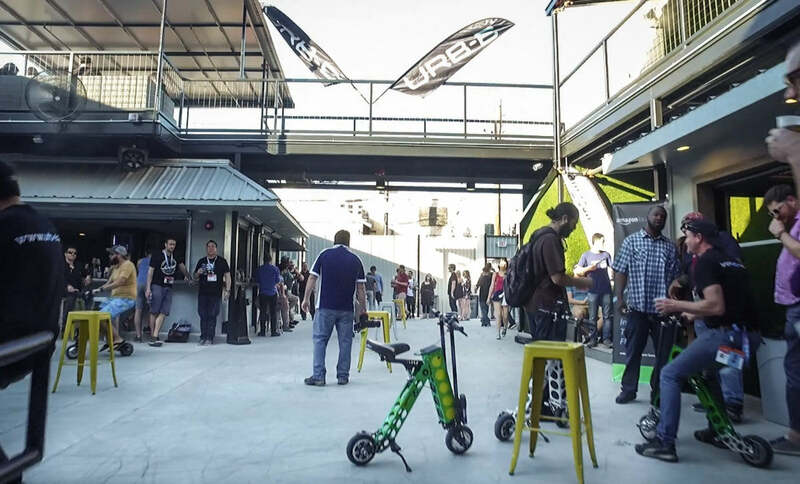 URB-E was the star of the night–we couldn’t stop giving test rides around the event space! If you’ve ever doubted whether URB-E is a hit at parties, let your doubts be forever silenced. In connection with the release of URB-E’s feature page on Amazon Launchpad, URB-E provided a fleet of vehicles for the Amazon Launchpad during SXSW Interactive. Launchpad team members not only traveled through Austin easily and efficiently, but they also used URB-E to showcase the innovative, cutting-edge products on their site. The Amazon team couldn’t have been more excited to use their URB-Es around town! Friday night we met up with Amazon Launchpad at WeWork Austin’s party. Launchpad used the event to showcase URB-E as their flagship product page. WeWork loved the URB-E so much that they had only one question: Why haven’t we bought these already? They immediately requested URB-Es for the rest of the festival, which they used to get to meetings quickly when the city was in gridlock. The competition is on! Amazon Launchpad challenged WeWork Austin to an URB-E Derby relay race, and when Pandora heard about the challenge they had to get in on the action! After a little friendly trash talk (#urbederby), they took to the streets! The event drew huge crowds rooting for the different brands, and led to hours of test rides. Check out the video of the competition here! What better way to enjoy SXSW than with a private URB-E party, complete with test rides, dancing, and a FREE URB-E giveaway! We packed Clearport and set up an URB-E ride course for partygoers. We can’t tell you how many times we heard, “This is the best party I’ve been to at SXSW!” Couldn’t make it? Here’s a video of the fun you missed. We stopped by the Spotify House party to drop off a few URB-Es for the Spotify team and for their headliner, Miguel. They had a blast riding around the venue, and Miguel even took his URB-E for a ride around town after he performed! Behind the scenes, LUXE Valet drivers used URB-E throughout the festival to reach customers’ cars. URB-E’s light weight and small profile when folded make it ideal for valet pickups. On Sunday, we talked to them about how their experience with URB-E had been, and they loved it! LUXE worked overtime at the festival, and one driver commented that he was actually excited for his 15-hour shift since he knew would be so much easier to get around with URB-E.
On Wednesday, we had to say goodbye to one of the most incredible weeks of our lives. There’s no doubt that URB-E is the ultimate fun and convenient vehicle for getting around festivals and urban environments, too! Thanks for joining us in Austin! We can’t wait to see you at our next festival! For questions about any of our activations, email tom@urban626.com or call .